Fri. 27. The weather is assuming a very agreeable aspect, the health of my men is improving. I received a letter from Carrie containing ten dollars. I commenced a regular course of drill with my Company again. I forgot to mention that our Colonel fell from his horse yesterday, and skinned is face very much, he was not otherwise injured. Nothing else of importance occurred. Sat. 28. I was officer of the day today. In the evening I went to the theater. Had some difficulty with the Provost Marshal, on account of his assuming too much authority. This was a cold night. Sun. 29. 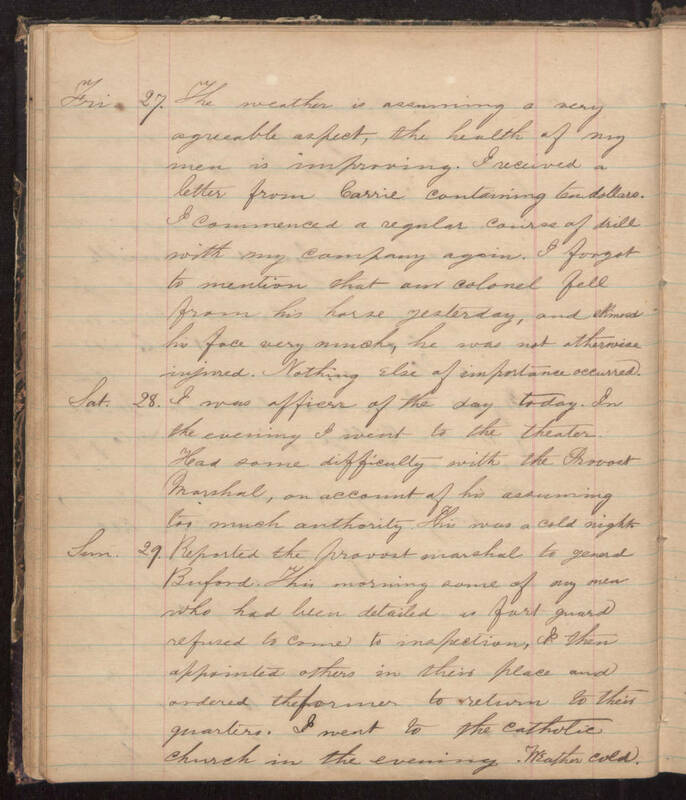 Reported the Provost marshal to general Buford. This morning some of my men who had been detailed as fort guard refused to come to inspection, I then appointed others in their place and ordered the former to return to their quarters. I went to the Catholic Church in the evening. Weather cold.